It’s time to add some height to our skyline! In yesterday’s post, we constructed a row of houses with half rectangle rooftops. In today’s post, we add to the batik skyline with some more buildings. 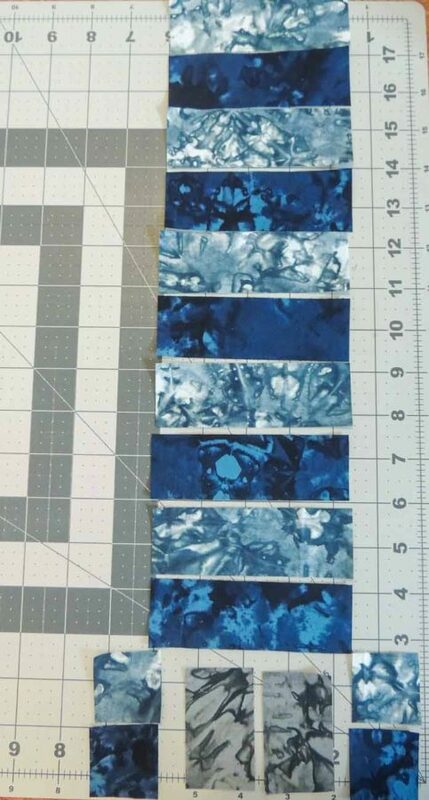 The Broken Glass batik fabric line from Northcott lends itself to designing a night scene. I really like how the fabrics add depth to the design and make it look realistic when you walk down a street at night with light playing off all of the windows. 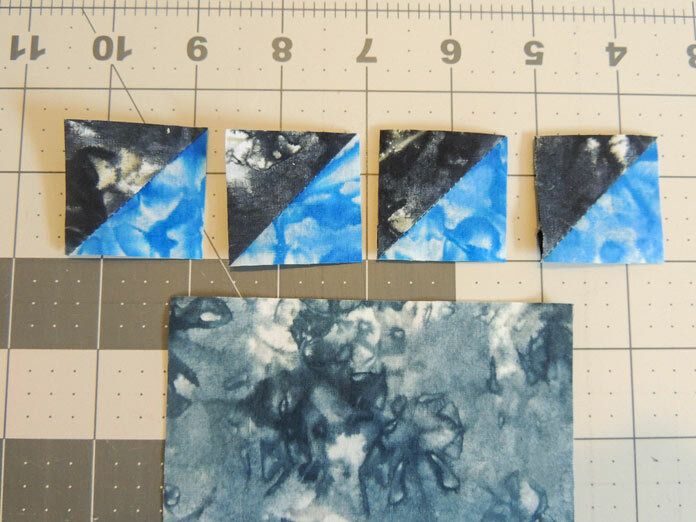 Join pairs of dark blue and blue-gray 1½″ x 4½″ rectangles along long edges. Continue until all units are joined. The strip should have a blue-gray rectangle at one end and a dark blue rectangle on the other. Once all the rectangles are joined then press all of the seams starting at the blue-gray end towards the dark blue. Pieces laid out to make high-rise building. 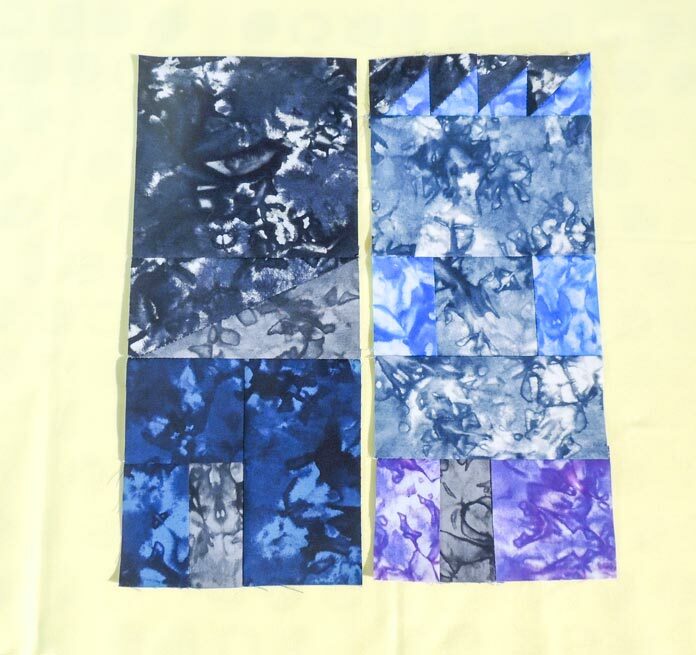 To make the door area of the high rise building, sew two pairs of dark gray and dark blue 1½″ squares. Press each seam to the dark blue square. Sew the two gray door 1½″ x 2½″ rectangles together along a long edge. Press the seam to one side. Sew a square unit to each side of the doors with the blue-gray square at the top. Press the seams away from the doors. Join the rectangle unit’s bottom edge (dark blue rectangle) to the top edge of the door unit. Press the seam down towards the doors. To the top edge of the high-rise building (blue-gray rectangle) sew the long edge of the black rectangle. Press the seam to the black. The high-rise building unit should now measure 4½″ wide x 15½″ tall. Pieces to make solar panel building. Draw a diagonal line on the back of each 2″ bright blue square. With right sides together, one bright blue square to one black 2″ square by sewing away ¼″ from each side of the drawn line. Cut on the line and press to the black square. Trim each unit to 1½″ square. Repeat with second bright blue square and black square to make a total of 4 HSTs. 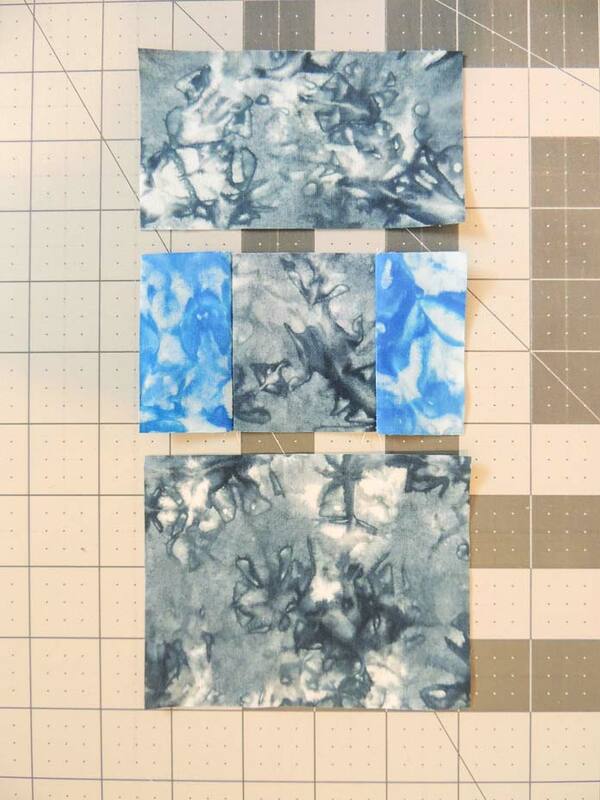 Sew the HSTs together in a row with the bright blue square on the bottom – see photo for orientation. Sew HST row to the bottom edge of the blue-gray; press the seam to the blue-gray too. 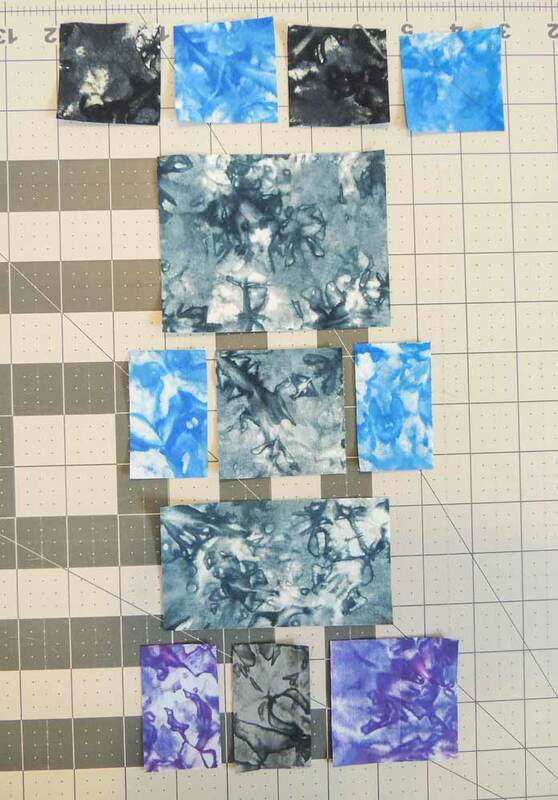 Sew one bright blue 1½″ x 2½″ rectangle along a long edge to two opposite sides of the blue-gray 2½″ square. Press the seams to the bright blue rectangles. Sew the bottom edge of the blue-gray rectangle/solar panel unit to the top edge of the bright blue rectangle/square/rectangle unit. Press the seam up to the blue-gray rectangle. To the bottom of this unit join the remaining blue-gray 2½″ x 4½″ rectangle by sewing along its top long edge to the bottom edge of the bright blue rectangle/square/rectangle unit. Press the seam to the blue-gray rectangle. Sew the purple 1½″ x 2½″ rectangle’s long right edge to a gray 1½″ x 2½″ rectangle’s left long edge. Sew the purple 2½″ square to the opposite long edge of the gray rectangle. Press both seams away from the gray. Sew the purple/grey/purple unit’s top edge to the bottom of the already assembled unit to complete the solar panel building. Press the seam up to the blue-gray rectangle. The solar panel building should measure 4½″ wide x 8½″ tall. Take the single remaining house and sew a short edge of the black 4½″ x 5½″ rectangle to the top of the house unit. Press the seam to the house unit. Sew the solar panel building to the right side of the house unit. Press the seam to the house unit. Sew this unit’s top edge to the bottom edge of the bottom long edge of the black 5½″ x 9½″ rectangle. Press the seam to the rectangle. Sew the right edge of the high-rise building unit to the left side of the house/solar panel building unit. Where seams meet, they should be pressed in opposite directions; if not, you can repress seams so they will nest neatly. Press the seam to the house/solar panel building side of the new unit. Today we created three more buildings including a highrise for the skyline. The Banyan Batik Broken Glass fabrics continue to help build a night scene – come back for the next steps tomorrow! Aileen I agree! The Broken Glass fabric line is bold and beautiful! Thanks for commenting.